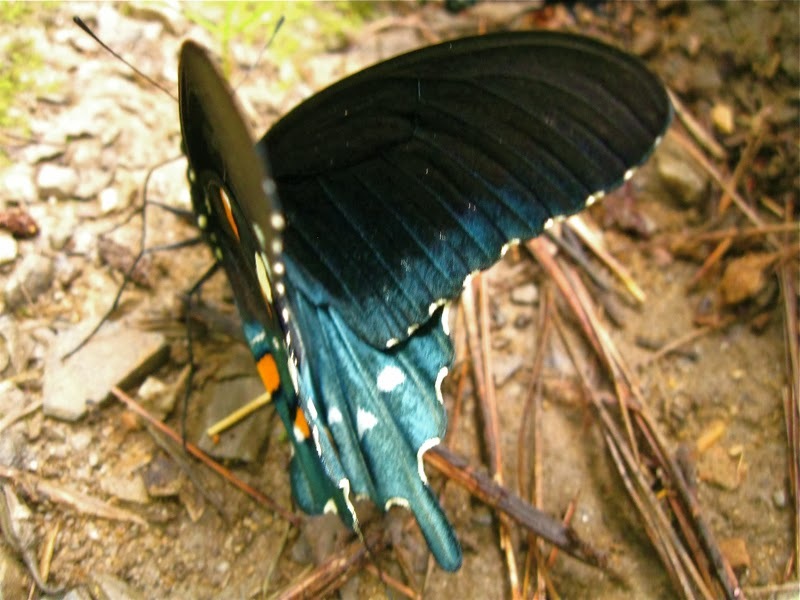 A fairly common sight encountered on our Smoky Mountain summertime excursions are bunches of butterflies sipping moisture from damp sand or damp, bare soil. Pre-stroke I usually saw them on hikes where butterflies and summer flowers competed for my attention. But this summer, toe problems added to my post-stroke limitations, meant no hikes for me and no flowers except those seen from a vehicle. But the butterflies generously accommodated my limitations. The one “hike” I made several times each day was to visit the campground restrooms nearest to our campsite. Within a few yards of the women’s restroom were patches of wet sand. The wet spots were adjacent to a stone water fountain close to the paved sidewalk. Clusters of colorful swallowtails were almost always taking advantage of the moisture there. 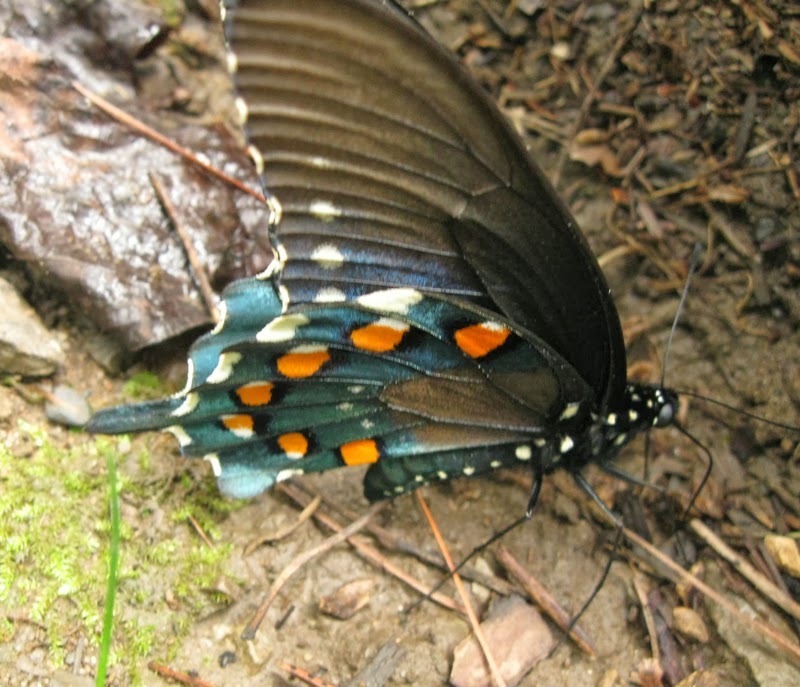 Our 2013 camping trip was the first time I had seen the butterflies in such close proximity to our campsite or near the restrooms. I could balance myself by leaning against the water fountain. From that position I could maneuver fairly safely for photographic stalking of my intended targets. Even better, neither my movement nor my camera close to them disturbed the lovely insects. And to top it off, I could get a drink of water from the fountain as needed! I may not have had opportunity to photograph Smoky Mountain flowers this summer, but capturing these flying and sipping "flowers" was immensely satisfying. 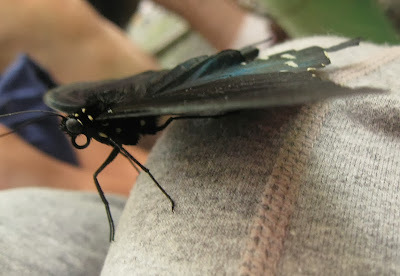 On my knee--a butterfly moment in our campsite. I think I handed my camera to someone else to capture this visitor. How wonderful - sometimes, new doors open when others are closed to us. I rarely see butterflies here in Hawaii. I wonder why. They definitely decided to pose for you. I'm impressed you captured them . They won't sit still long enough for me. These are wonderful!!!! Your shots are so good and not blurry at all, specially the close up of the spots, I love the orange ones with the black around the edge. 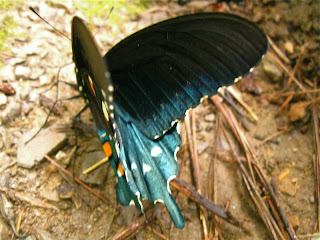 I enjoyed your photos of the 'flitting flowers' :) I've always loved butterflies. So what's wrong with your toes? One broken toe is slowing me down here.